Some Trails and Pathways projects will serve as important connections for existing commuters, and some will create opportunities for new commuters where it was previously unsafe or impossible. But it is more likely that most, if not all Trails and Pathways projects will enhance Delaware from a recreational standpoint. Car trips eliminated from any new crop of commuting cyclists may be offset, or even increase as a result of folks racking up and driving their bike to a trailhead. Certainly, biking for exercise is important from a health and wellness standpoint. What about projects whose main objective is to circumvent dangerous roads? The Industrial Track Rail Trail does just that. 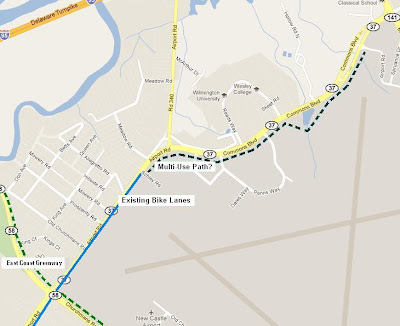 When complete, it will allow bicyclists to avoid Route 9 - and everything along Route 9 - between Old New Castle and Wilmington. But noticeably absent from any consideration is Commons Boulevard in New Castle. AASHTO grade bike lanes installed on Airport Road in 2007 disappear into a 4 lane high speed arterial road, where traffic is especially hostile and intolerant of bikes during peak times. Except for the brazen, there is no safe way to reach Reeds Way – home to Wilmington University, Wesley College, and New Castle County’s Govt Center – as well as the New Castle County Airport by bike. Above: The point at which the bike lanes on Airport Road disappear into the curb at the start of Commons Blvd. Few cyclists would attempt this during peak travel times unless riding in a group. Right lane Sharrows are out of the question given the high speed environment. You can advance forward or circle around by clicking on the arrows. 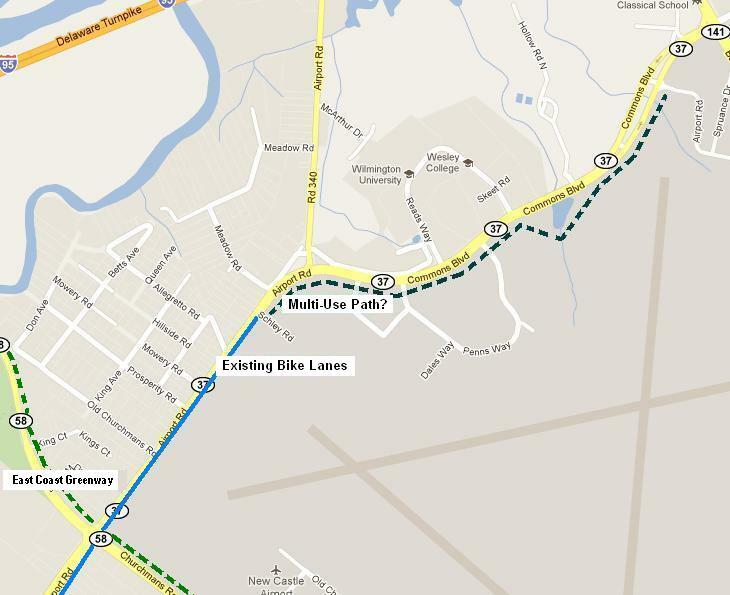 Here is a pathways opportunity that would put a significant area of NCC back on line for bicyclists. Such projects should be high priority when it comes to patching together real bikeway networks that use both on and off-road facilities. I'd add my voice of support for this. I work at Reads Way, so this affects me pretty directly.